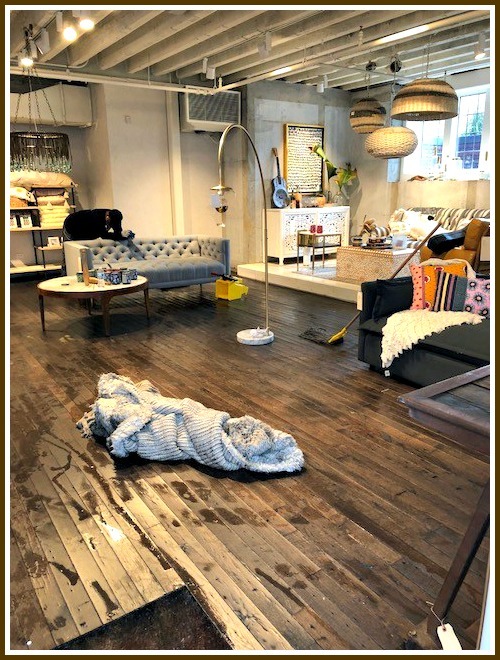 Anthropologie Floods; More Storms Ahead? When Bedford Square was built, a state-of-the-art, expensive flood control system in the basement promised to eliminate the problems that bedeviled the YMCA, when it stood on that same Post Road/Main Street corner. 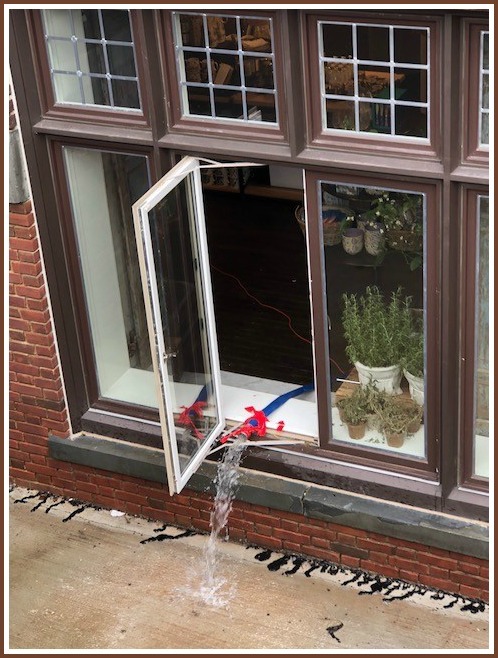 The issue was not water pouring in from outside. Instead, it rose from beneath the structure. The new system might handle most rains. But yesterday’s torrent — up to 7 inches in 4 hours — overwhelmed even this design. 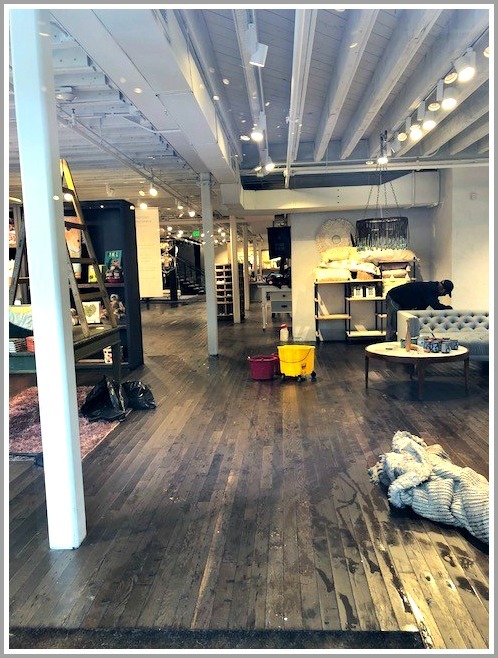 Anthropologie — the 40,000-square foot anchor tenant in the still-new retail/restaurant/residential complex — is closed today. A large crew of workers are cleaning and vacuuming, after 6 to 8 inches of water filled the basement level. Our weather woes may not be over. The National Weather Service warns of possible severe thunderstorms tonight, with gusty winds and heavy rain. … and the front door. 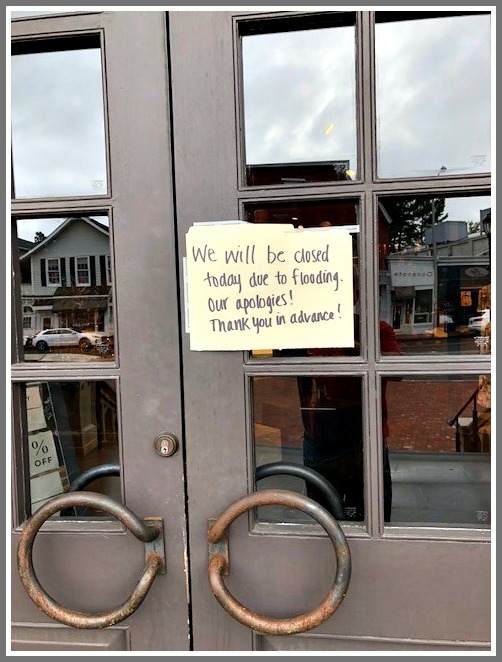 This entry was posted in Downtown, Local business, Weather and tagged Anthropologie; Bedford Square; Westport flash floods. Bookmark the permalink. How did the stores on the west side of Main Street do? I remember how badly they flooded during one of the hurricanes (Irene?) (Sandy?). Those wood floors are not going to be happy when they dry out. That is not what happened. 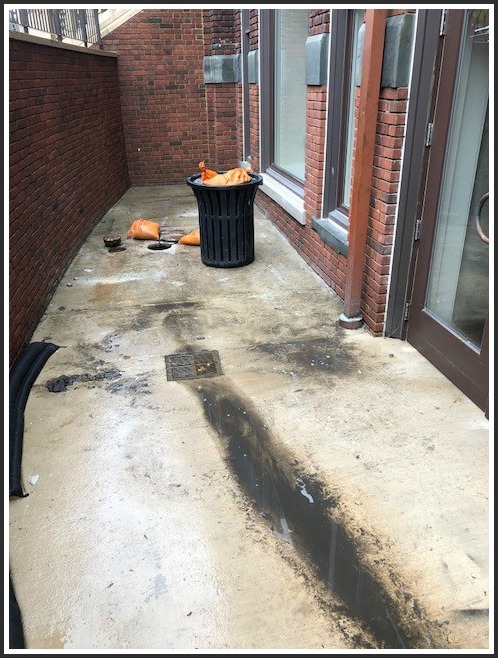 In this instance the force of 7 inches of rain in little over an hour caused so much pressure on a back flow preventer that it blew the lid right off This then allowed sewage to flow unchecked thru a 4 inch main into Anthropoligie’s Main Street exterior lower level stairwell. Sadly we did have a back up for that stairwell filling up but the debris from the broken valve clogged our 4 inch drain which caused the water to fill up and enter the Anthro’s lower level through the doors. With that said, no water ever entered the building from the ground up, no flood waters entered the property and the engineered design put in place were able to handle the massive amount of rain effectively. Our property managers did an exemplary job getting the broken pipe capped off and our 4” drain unclogged. Once they did that the water drained as designed. Crews have already begun work to clean out the basement. In all my years of living in town and managing commercial. properties I have never seen the water come up so fast and so quickly. As a property manager I will not only have to make sure our properties are prepared for hurricanes and nor-Easter’s going forward but will now have to add flash floods as well. We all enjoy living and working close to the water but that access does come at a cost and in end the end, Mother Nature will always win. Just read the current comments, and certainly sounds like the property owners/managers are doing all they can. Good job! But, I feel like we’re all fighting a losing battle, in the long (short?) term. How will any amount of drainage “systems” prevent the inevitable? If one builds (or re-builds) at or near “sea level”, then me thinks the sea will eventually win the battle. Agree. High density construction and water do not mix.